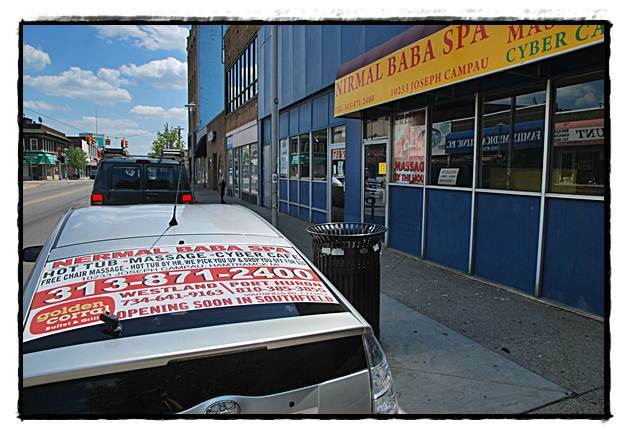 A would-be massage parlor lasted all of one day before the city shut it down. The incident is bizarre to say the least. Reecently, several street signs popped up throughout town announcing the grand opening of the Nurmal BaBa Spa on Jos. Campau near Trowbridge. The spa offers the services of a massage parlor, cyber café and also hourly hot tub rentals. It also offered to pick up customers and drive them back for $10. But before customers could start to stretch out in a hot tub, the city swooped in and closed the spa for not getting numerous permits and a business license. Owner Arvindbhai “Andy” Patel said he expects to have the permits and necessary improvements to his facility ironed out. City Manager Bill Cooper said there is a long list of things that need to get done before that happens. “This guy is not following the rules,” Cooper said. A Review reporter was invited to tour the spa. There was a row of laptops on tables along one wall, but there were no outlets to plug them in. The hot tubs were in four separate rooms, filled with water but with no plumbing fixtures hooked up to them. Patel also faces several tickets for violating the city’s sign ordinance because of his street signs. The city confiscated the street signs. Patel said he decided to open his business in order to provide jobs for the community. He described himself as retired. As for health and hygienic concerns about the hot tubs, Patel insisted they are safe for the public to use.